A round-up of the'Tuning Fork' idea for small layouts started in MTI46. A British 'heritage' shunting yard set in the early diesel/steam era in HO based on a 1952 layout. How a European small S gauge narrow gauge layout was built, economy style. The modelling possibilities of an American shortline. A very small American N scale layout built as an easy 'tuning fork' module. Some actual examples of real-life 'Tuning Fork' yards, both American and European. Making use of an 'off the wall' cork notice board as a baseboard. The possibilities of altering and adapting proprietary models, with examples. 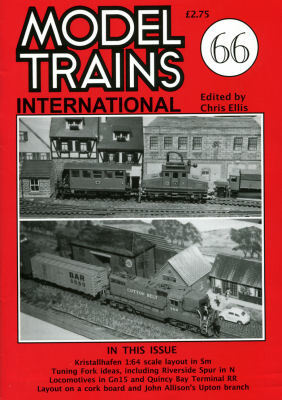 The method(s) adopted to operate a small American HO switching layout. Some musings on the 'art' of modifying other people's layout ideas, featuring Port Abel, MTI 44.